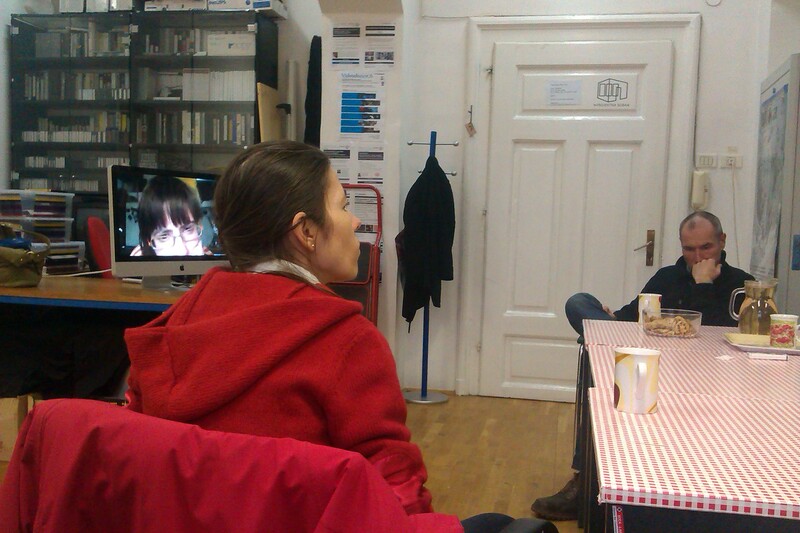 Participant of the workshop for writing Maja Antončić has written a thorough analisis of the meaning and impact of Video Turn project through a critical evaluation of the intention of the artists and the results this intentions had produced. Artists’ Neven Korda and Miha Vipotnik have offered to additionally edit the video documentation in order to make it more than just a document and more in accordance with the intentions of their conceptual and artistic work. Andreja Muha who was one of the most active student participants of the process has presented the student’s experience, again stressing the invaluable hands on experience and mentorship by Vipotnik. She has also explained their uncertainty when working in the process with numerous unknowns, open opportunities and free choices in constructing the scenography. 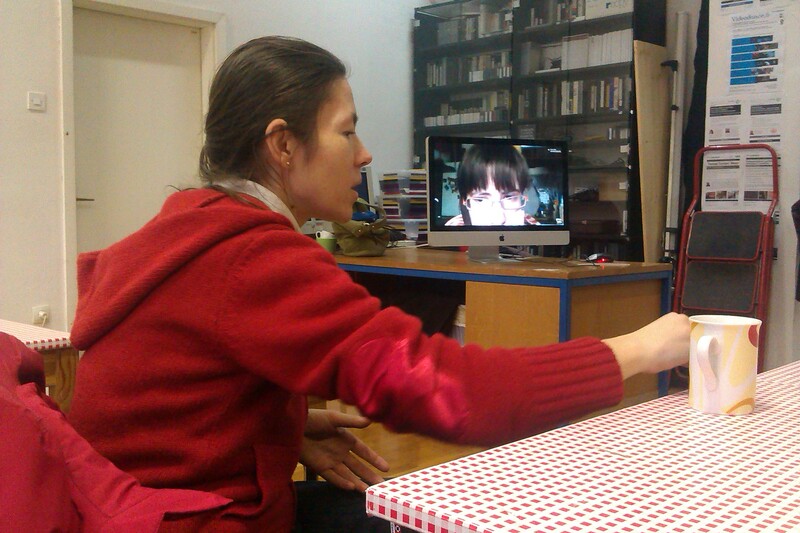 Petja Grafenauer joined us via Skype to reflect upon the process of critical writing about the exhibition. She was content with the end text and also publishing of one of them in a magazine, however she has stressed that there were too few texts by other participants, which might also be a consequence of a time consuming and demanding process. A workshop for analysing and writing texts on experimental video installations in the context of School for Curators and Art Critics of the World of Art took place in parallel with the exhibition under the guidance of Petja Grafenauer. Participants of the workshop were divided into two groups, the first focused on observing an researching Neven Korda’s installation and performances, and the second monitoring the process of Miha Vipotnik. As a result, a text by Amalia Stojsavljević (student of 14th year of the World of Art) was published in the 96th issue (Winter 2012) of The Art Words Magazine. 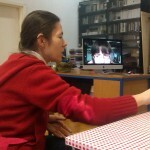 Introduction was written by Barbara Borčić (Video Turn project leader and World of Art adviser). 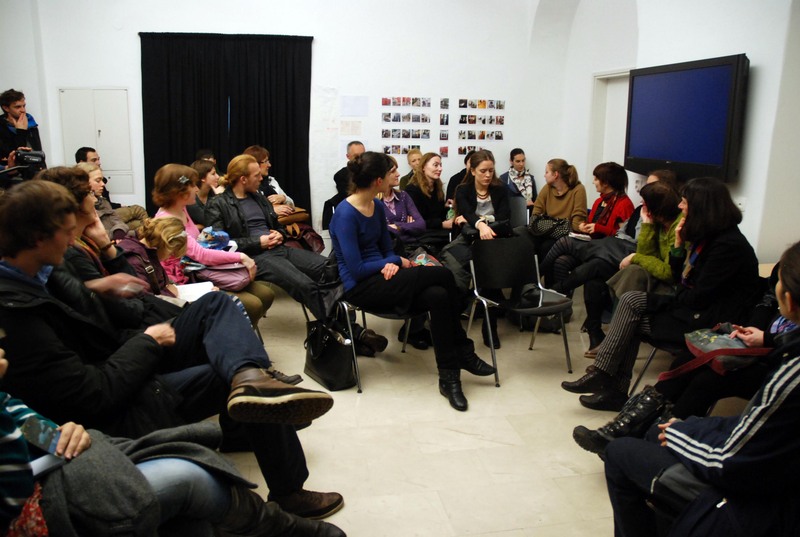 The discussion at the end of the Video Turn exhibition project attracted a great number of people. Besides the numerous participants, the curiosity brought in also some representatives of the so-called interested public – as mentioned by one of them. The collaborators on this project varied in background and occupation. This was after all a very important part of the experimental practice, which we tried to explore and materialise in the course of a bit more than two weeks at the Vžigalica Gallery. The process of developing the installations was accompanied with quite a few obstacles and traps, dilemmas and presupposed expectations, and also some disappointments and small incidents. 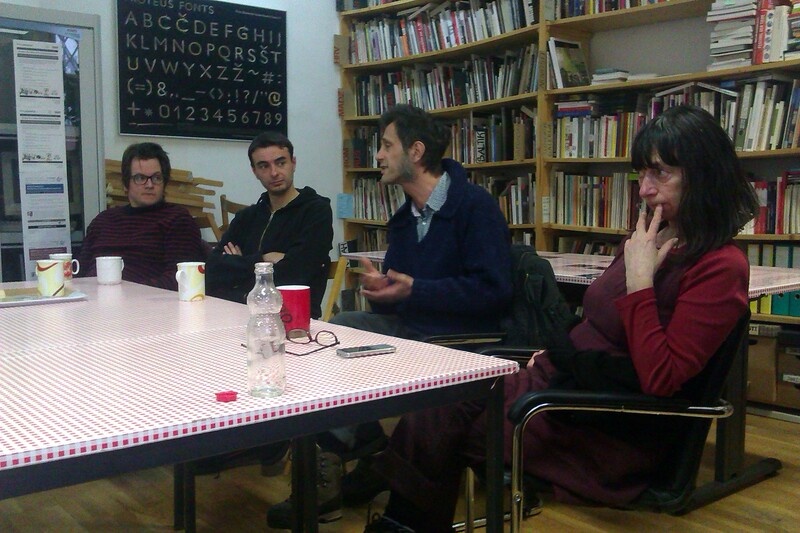 Neven Korda spoke about his experience with the series of five events-performances in the framework of the workshop situation and about his changing installation entitled Dominant Black. In this repeated and evolving performative atmosphere that has built a tight relationship with the audience we were able to recognise and understand Korda’s experimental video practice – as it was also elaborated by one of the participants of the workshop on writing about this exhibition. These live events were also valuable opportunities for questions, discussions, and opinion making. Sergej Kapus made an important contribution to the project by Miha Vipotnik, as an expert and author of several research books on the oeuvre of Jožef Petkovšek, and fervent interpreter of his painting entitled Home, which served as the base or a starting point for this project. Kapus greatly contributed also as an important communicator as a professor at the Ljubljana Academy of Fine Arts whose students played the key role in building the setting for this installation. He actually opened the gateway for his students to step into an unknown situation of an open and creative workshop. Kapus stressed the importance of such experience for everyone involved, while students themselves commented how important they found the slowly building relationship and understanding with Vipotnik, and upgrading their understanding and engagement with the process that also brought them joy and pleasure. During the discussion we made a short break in order to open the curtains and invite the public to step into the Home installation to view the final outcome of the recorded sequence. A number of participants and actors who contributed to the making of this artwork were present at the gallery. Amongst them the most busy with the final touches were the cameraman Daniel Alberto Rodrigues Correia and assistant director Lucia Smodiš. 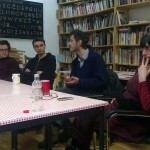 Vipotnik was absent – just as at the beginning of the workshop. At that very moment he was somewhere on the plane between Istanbul and Beirut. Conceptually his absence had some relation to the reasons behind the topic of the installation “home” which is sometimes a very unstable and uncanny place. We sent him photos and videos that were constantly being documented by photographer Jasna Jernejšek and video editor Toni Poljanec – also published on these blog. For the installation, Neven Korda re-used video materials that coincidentally appeared as reflections and glitches in his latest installation Simply Beautiful at the same gallery in the context of Lighting Guerrilla Festival in spring 2012. From the video feedback loops that he created then, he took only those serendipitous elements that have been brought to life without the artist’s conscious planning. 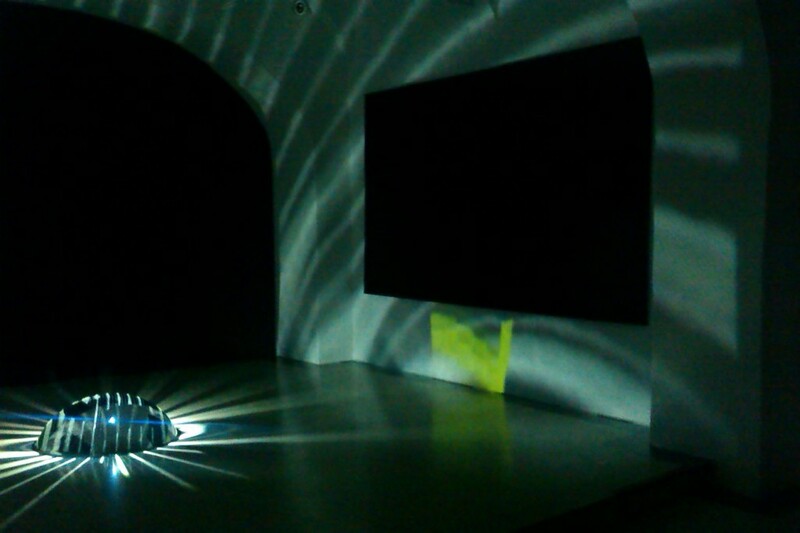 The installation was fully illuminated only when using a stronger video projector. For this rather small space the 5000 luma projector was sufficient. For Dominant Black installation Korda also tested the beta version of an open source software tool for video mapping Mapper, developed by Boštjan Cadež. Korda previously collaborated with him on several other projects, which included architectural and contextual video mapping, such as Parallel Worlds Series on Square Without Historical Memory at Metelkova or The Power of Desire at Novi trg in Ljubljana. This time, he adopted video mapping by masking the reflection of the three black rectangular pictures and one black arch on a reflective hemisphere in the middle of the space. The black surfaces were covering all the major areas of the room. In this way he made an illusion of dominant black pictures that eradicated the light, while the margins were illuminated in the never ending loop of contemplative light textures.